What a great find! So glad you found Warehouse! What a great top to invest in. I love the Warehouse version. I love the look of Warehouse! Love the Warehouse top! A must have this spring! Oh the warehouse one is pretty! I love how it is perfect for Spring. I could see this with skinny jeans, shorts or even a pretty skirt. I actually like the ASOS style better. I think that it's prettier with the stripes set higher in the top. Am off to Asos right now! 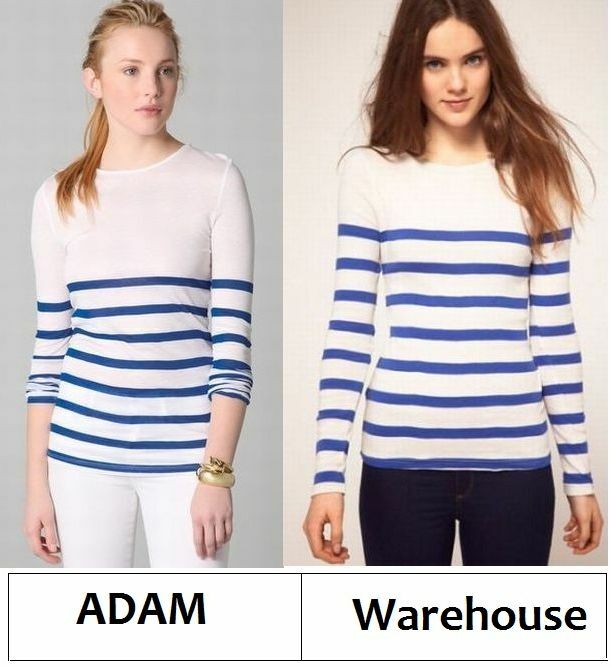 The Warehouse one for sure! Save. I like the higher stripes, plus the price is amazeballs. i have been craving a new striped top! i have a few, but i need something for spring/summer! these are cute! Love this! I love stripes right now and mixing them with prints and pastels! They are both adorable! I love the blue stripes. Blue and white are a summer staple color combo for me. What a great find for such a cute basic! Warehouse for me! Great find! SAVE! I like that one better too! Great find. I actually like the look of the Warehouse a little better. The Adam looks a little slouchy...almost like it doesn't fit right! Love these! The Warehouse jumper is so pretty. I actually like that the stripes start higher on the Warehouse top. Ive seen so many pretty striped tops with neon colors at the top...want!! Oh wow. I have a similar top that I bought last year at the Wal-Mart in Puerto Vallarta for about $15.